Jazz guitarist Steve Khan was once a member of the Chantays, replacing Bob Welch in 1964. This 1983 album includes a Latin jazz rendering of the Pyramids' classic "Penetration." The music on this album is a fusion adventure, but it's the jazz-surf melt that brings the biggest grin. Lots of electronic percussion and the sense of surf moved on. "The Breakaway" is an engaging number with great shallow whammy chords and Latin percussion. It's melodic in a futurist sort of way. 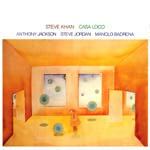 "Casa Loco" is slow moving and atmospheric, with an island feel, and a gentle energy. If you stare into the sunset, you can see the surf at the edge of the horizon. This unusual reconfiguration of the Pyramids' hit single finds Steve Khan's surf roots in the Chantays showing through his fusion leanings and Latin influences. The fuzz chords in the bridge give this percussion and liquid distortion rendering a new and uniquely New York feel, like Liquid Liquid on a longboard. Quite cool. Adrift in the afternoon sun, "Uncle Roy" melts with long chords and atmospheric sound. The bass is very cool! "The Suitcase" is part tweaky, part light rock, with very cool percussion. Not really melodic, but the structure and textures work really well together, and the electronics add intrigue. Big fuzz chords suggest a harder edge. There's a very cool bass glissando midway!